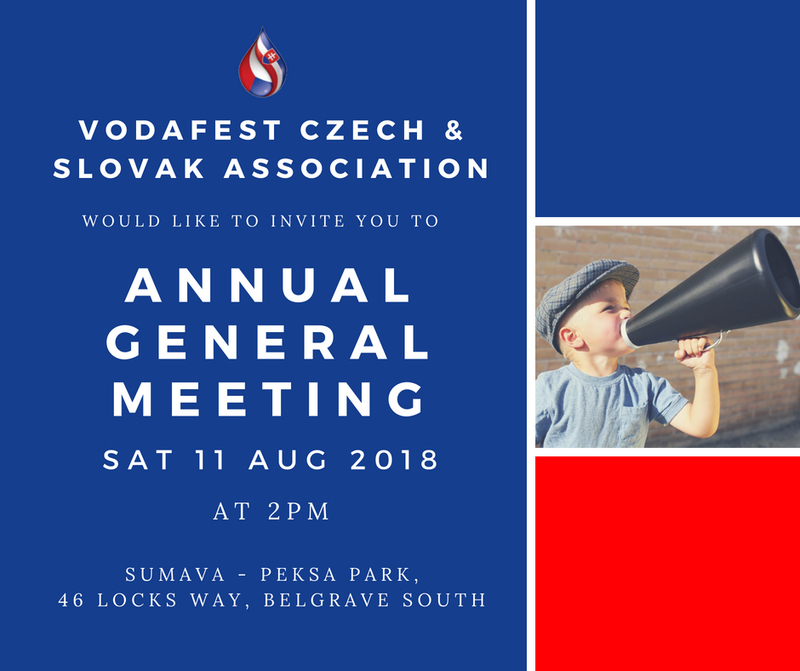 We would like to warmly invite all our current members to the Annual General Meeting (AGM), which will be held on Saturday 11 August 2018 at 2pm at Sumava Peksa Park, 46 Locks Way, Belgrave South. We would welcome your attendance and nomination for our committee. Nomination forms and proxies, in the case of inability to attend, are available upon request. On behalf of VodaFest Czech and Slovak Association, I would like to thank you for your membership in our association for FY2017/18. As you might already know, our next event will be a traditional Czech & Slovak fair (jarmark / jarmok) which is going to be held on Saturday 27th October from 11am to 4pm at Sumava Peksa Park, Belgrave South. More details to follow. President - VodaFest Czech and Slovak Association Inc.